Flannel ugh street art deep v, dreamcatcher skateboard single-origin coffee. Food truck fanny pack slow-carb Helvetica, fingerstache Marfa Williamsburg. Disrupt flannel before they sold out, DIY Carles swag Tonx retro ugh iPhone viral 3 wolf moon High Life whatever drinking vinegar. Originally published by Organizing Upgrade, July 2012. I’m pretty sure the first time I heard the word “Anti-Intellectualism,” I said “that word is so elitist!” Luckily, I was in the company of one of my greatest teachers, June Jordan. After giggling uncontrollably (her giggle-fests were legendary), she asked me what I thought the word meant. Little did I know we were beginning a dialogue that would last more than a decade, and shape my view of the world. It was such a powerful example of the problem with anti-intellectualism (hostility towards intellectuals or intellectual work), that I still remember it, 15 years later. Well… that and the fact that she was calling out my paternalistic view in no uncertain terms. Here I was, getting excellent grades at a fancy university, claiming the real problem in society was big words. I worked 3 jobs and accumulated a huge debt to attend the school where she taught. If education that important to me, why would it be less important to anyone else? Lucky for me, she was patient with my contradictions, and her passion was contagious. “Come sit over here.” she continued, “Did I ever tell you about the Sandinistas?” June started to tell me of her experiences in Nicaragua in the 1980s. The Frente Sandinista de Liberación Nacional (Sandinista Front for National Liberation, known by it’s Spanish acronym FSLN), a left wing political organization, led the 1979 overthrow of dictator Anastasio Somoza, ending his families’ right wing political dynasty in the country, and ushering in an era of profoundly progressive social and economic change. June was so proud to be the first black journalist to travel to Nicaragua, and document the success of that movement. Following Sandinistas around with a steno notebook from a meeting in Managua to a school in Estelí changed her life forever. “The feeling,” she said, “was like falling in love.” She described the wave of enthusiasm; the desire to give your best self to this joyful, complicated, collective process. The feeling that everyone you met was a cousin that just arrived at some kind of revolutionary family reunion. 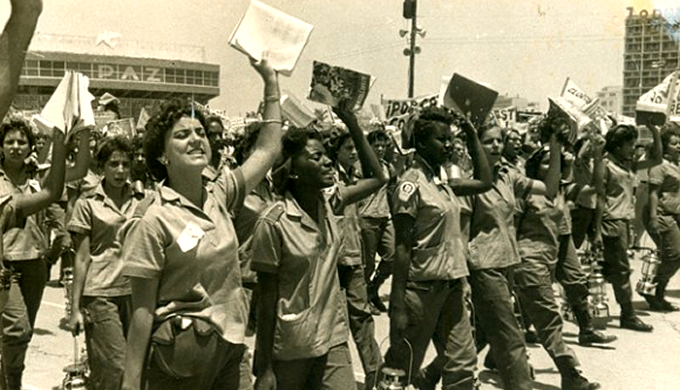 Their consciousness-raising was deeply influenced by the methods and theory of Brazilian educator and militant Paulo Friere. Friere’s theory (Pedagogy of the Oppressed) and methods (Popular Education) had the goal of “conscientização.” Originally coined in Brazilian Portuguese, and common in Spanish (“conscientización”), the term refers to the process of developing critical consciousness. Which is to say, learning to read the contradictions in social, political and economic life, and learning to take action against the oppressive aspects of reality. Illiteracy, the brigades said, was not an individual problem. It was a social problem that everyone had responsibility for, and it required a community-based solution. And, this community-based solution would not only eradicate illiteracy, it would also raise consciousness. Volunteer Brigadístas learned as much as they taught. They returned from their work with peasant communities humbled and inspired by the resilience of the families they lived and worked with, and ready to support the struggle for economic justice that the peasant organizations were leading inside a broader progressive front. Rural communities learned too. Here in the United States, the right wing has been so successful in tying working class identity to anti-intellectualism, that we can hardly tell the two apart. And that confusion shows up inside our movement as well. We often critique intellectual work as if it has a class nature in itself, instead of recognizing that, like artistic, scientific, or therapeutic work, it can be put to the service of any class. If intellectual work is associated with the capitalist class and with class privilege, it’s simply because the capitalist class has control over it. And it’s a powerful thing when intellectual tools are in the hands of oppressed people who know they are oppressed. June knew that when she started Poetry for the People, which supported young people in finding their voice, and required that students teach in the community, giving classes at Glide church, FCI Dublin Women’s Prison, Berkeley High School, and Mission Cultural Center. The right wing in Arizona knows that too, and it’s why they have so viciously attacked Chicano Studies. They saw the danger of a growing level of organization connected to a pipeline that trained and educated movement builders. Our social movement needs to claim the power of intellectual work, now more than ever. Community organizing, direct action, and mobilization are powerful tools. But divorced from political education and critical engagement in the world of ideas, they are not enough to win the scale of change we need in our communities and in our world. It must be noted that these days we see plenty of man-made disasters in nature, like those related to climate change!